Paris™ 2 (NSN: 6230-01-575-9896) has been developed as a more durable version of the traditional MS-2000M Distress Marker Light. Paris™ 2 (NSN: 6230-01-575-9896) has been developed as a more durable version of the traditional MS-2000M Distress Marker Light. Constructed from a solid billet of aircraft aluminum, the Paris cylinder walls are more than 2.5mm thick making the beacon virtually crush proof. The beacons signal is turned ON or OFF simply by rotating the bezel. Once switched ON the beacon immediately begins emitting a fixed flash rate IR signal identical to that of the Phoenix Jr. (NSN: 5855-01-438-4588). 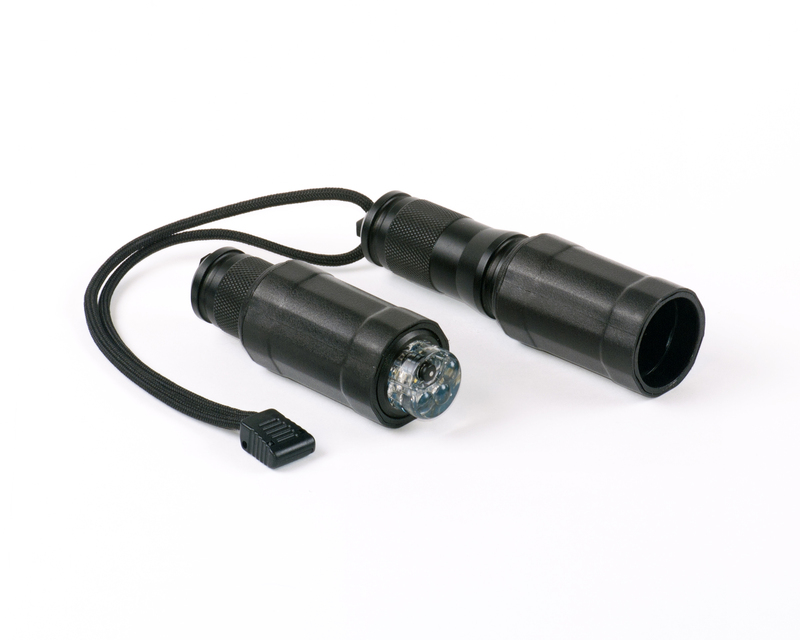 When activated, miniature indicator lights within the device will temporarily flash allowing the operator to visually confirm that the beacon is operating correctly in situations where their own night vision equipment has become lost or damaged. Once ON, the operator can then switch to broadcasting a visible Blue strobe pattern via the units single watertight pushbutton switch located at the top of the beacon. If the unit is turned OFF and then back ON, the unit will default to its IR signal mode negating the risk of inadvertently transmitting a visible signal where concealed operation is critical. The Paris beacon also features an integrated shroud. With the shroud extended, the beacons signal can be focused in a specific direction limiting unwanted emissions during operation. The beacons watertight design and 300+ hours continuous operation from its two CR123A batteries power supply make the Paris superbly suited as a distress marker light in the most hostile environments. Paris includes a 550 paracord retention lanyard.